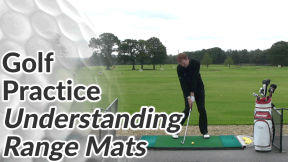 In this video and article I’d like to cover what I believe is one of the best golf practice routines for any club-level player to adopt. 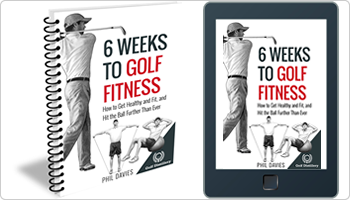 It’s time friendly, it’s enjoyable and most importantly it’s specific to the game of golf. There are so many amateur golfers that find it easy to slot into a rhythm at the range but can’t transfer their ball striking and consistency to the course. 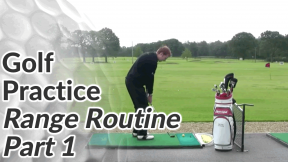 This practice routine will fix that. I think a lot of enthusiastic golfers actually do more harm than good when they visit the range. They hit buckets and buckets of balls in the hope that sheer repetition will fix their faults. 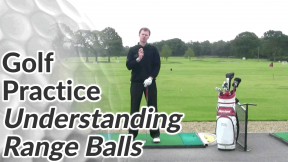 Or they become so fixated on just the technical elements of their swing, they find it very difficult to actually hit the golf ball with any real consistency out on the course. With the right type of routine and the right type of focus, I believe any golfer can achieve fantastic results with much less commitment to practice than they think. 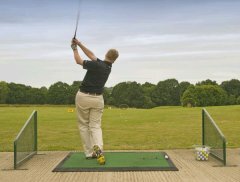 Next time you’re at the practice range, think of a course you know well enough from memory to envisage each hole and its hazards. You’re going to play this course using a bucket of range balls! Imagine the first tee shot. Is it a driver down a dog-leg fairway? A mid iron to an opening par 3? Pick an approximate target out on the range that corresponds to the target you’d have for your first tee shot and choose the same club. If you are having problems imagining where the fairway would be on the range, stretch your arm out in front of you and make a fist. Looking down the length of your arm, the width of your fist will roughly equal the width of a narrow fairway. Once you’ve hit your opening tee shot on the range (and do use a tee), think about where it would put you on your imaginary course. How far would you have for your next shot? Pick a club that corresponds to the distance you’d have left. If you hit off line or mishit a shot, your third or fourth shot is going to be a chip or lob shot. Imagine the green and the hazards around it and then go ahead and find a divot or spot in front of you that’s about where you’d want to land a chip shot. Depending on how close you land your chip shots, add on 1-3 putts to finish the hole (if you have a practice putting green, you can finish the holes off for real later on). Keep your overall score and throw in the odd trouble shot here and there to keep things even more realistic. For this practice routine, you’ll be hitting virtually every shot with a different club, rather than pounding 20 consecutive balls with a 7-iron. You’ll be going from delicate chips to powerful drives – just as you would do on the golf course. Make sure you practice your pre-shot routine for each and every shot. Step back from the ball to pick out your target. 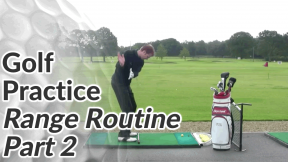 Make 2-3 practice swings. 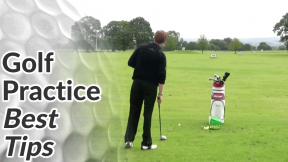 Allow your first practice swing to be quite technical where you remind yourself of key checkpoints and let your second practice swing be more fluid where you focus on rhythm. The beauty of this practice routine is that it focuses your mind as much as your physical swing. 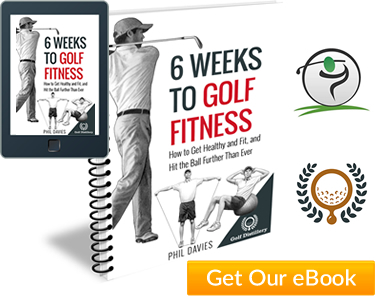 It will improve your concentration and your decision making out on the golf course. When you actually hit each shot during this routine, practice this technique to help you clear your mind of too many swing thoughts.